I love Yosemite National Park and am blessed to live nearby this gem. Today Mary Elizabeth and I drove to the high country to explore the area of the Golden Crown and Ella Bloss mines. Mary Elizabeth at the trailhead. 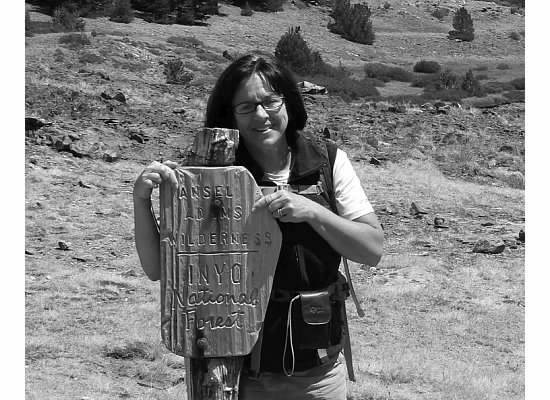 We took off on foot on the Mono Pass trailhead following the trade route of the Miwoks. Lupine and paintbrush were scattered about, daisies popped up in spots, and a handful of gentian were fading away. It looked nothing like last month’s stunning show of wildflowers. 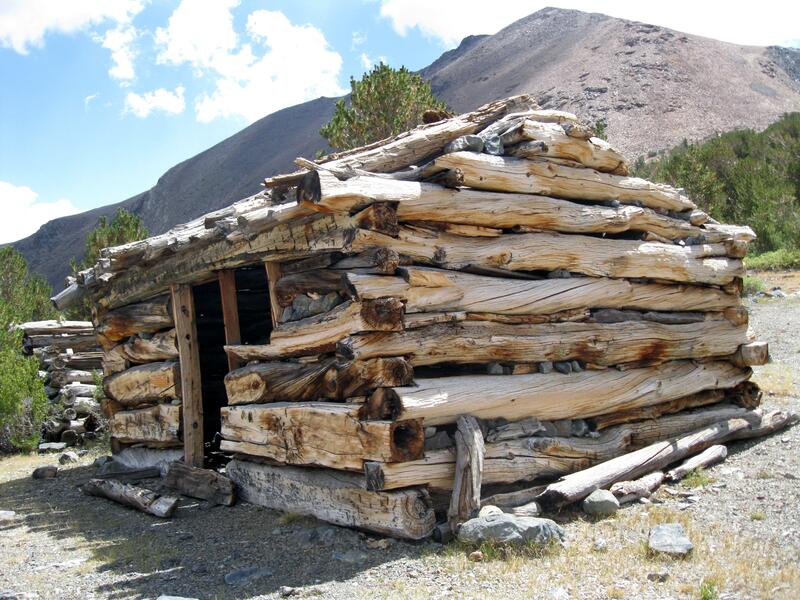 Collapsed Sheepherder’s cabin, circa mid-1800s. Early on we came upon the remains of two cabins located near picturesque meadows. The cabins were used by Basque sheepherders who grazed sheep in the meadows. 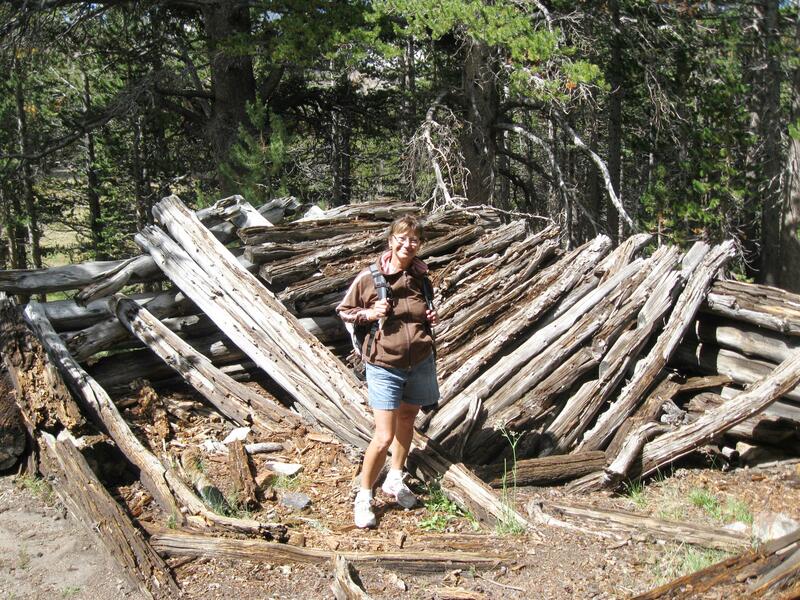 Remains of a sheepherder’s cabin. 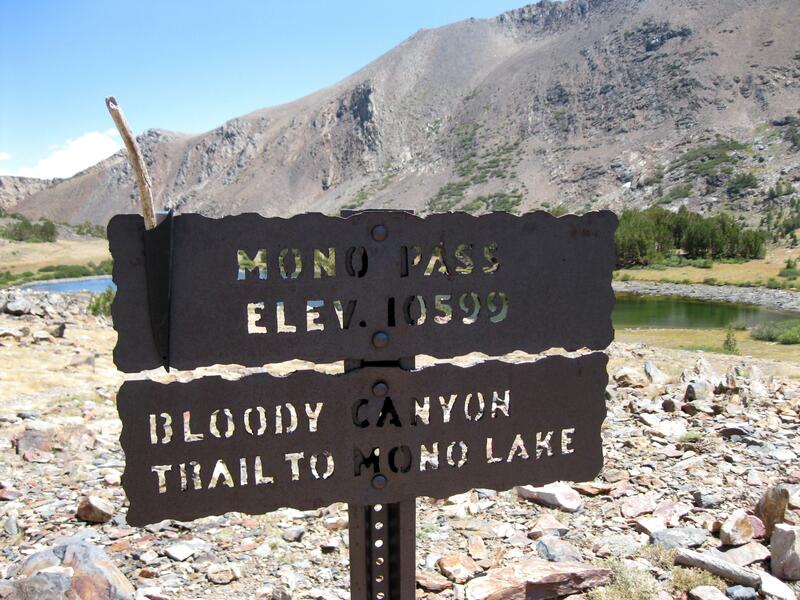 We trudged uphill then out of the woods to Mono Pass. Passing an unnamed pond, we saw a mine shaft in the distance that appeared on the map. 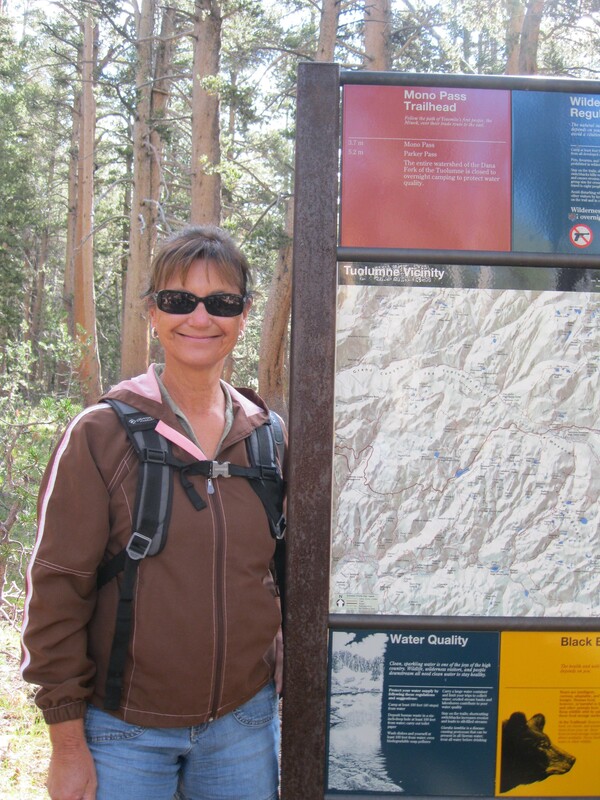 Leaving the main trail, we headed towards the mine shaft via the uphill spur trail. 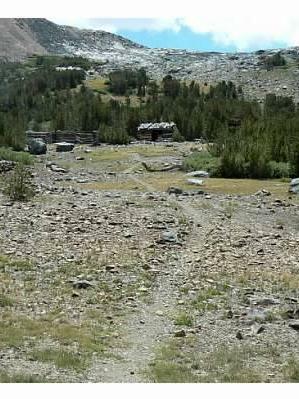 The spur trail leading up to the mines and cabins. Large piles of rocks were heaped about, rocks that miners discarded as they dug down to access the underlying ore. Unfortunately for them, no silver was taken from the area and the mine was abandoned shortly after it began. 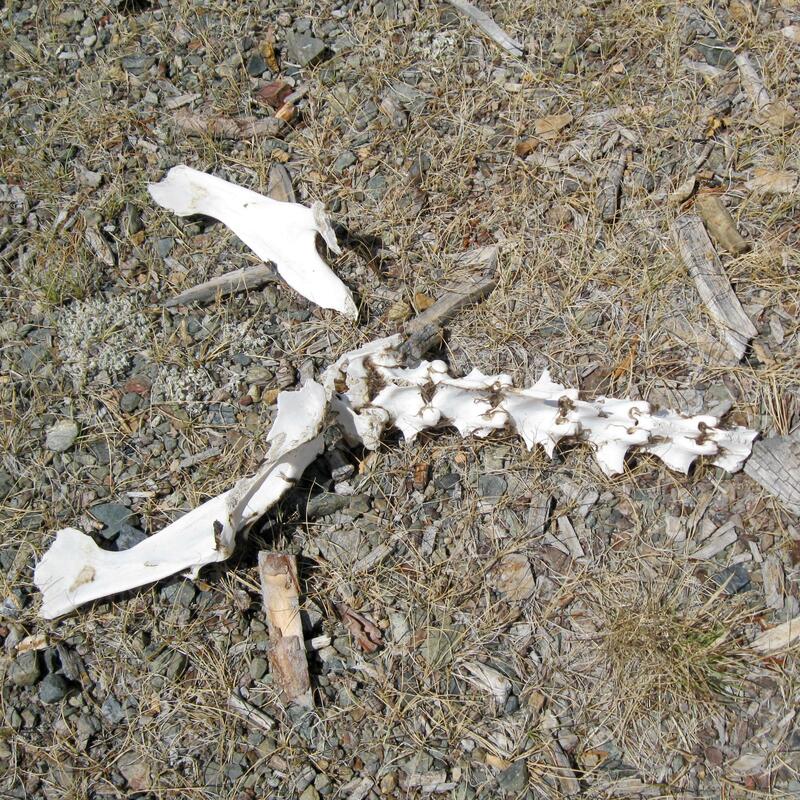 Lying on the ground amid the rock piles was a partial animal skeleton. Nearby were four cabins, possibly used to house the miners who worked in the area. The cabins reminded me of Lincoln Logs in the way there were constructed. Some were well preserved and others were like the animal bones we saw, partially intact. We left the windy area as Clark’s Nutcrackers flew about. Back on the Mono Pass trail we walked out of Yosemite National Park and into the Inyo National Forest and Ansel Adams Wilderness. Ansel Adams was a photographer famous for his black and white landscape photos. The area was expanded and renamed after his death in 1984. We noticed that with the change from national park to national forest came a switch in trail markers from rusted metal signs to wooden signs. We’re heading towards Sardine Lake. 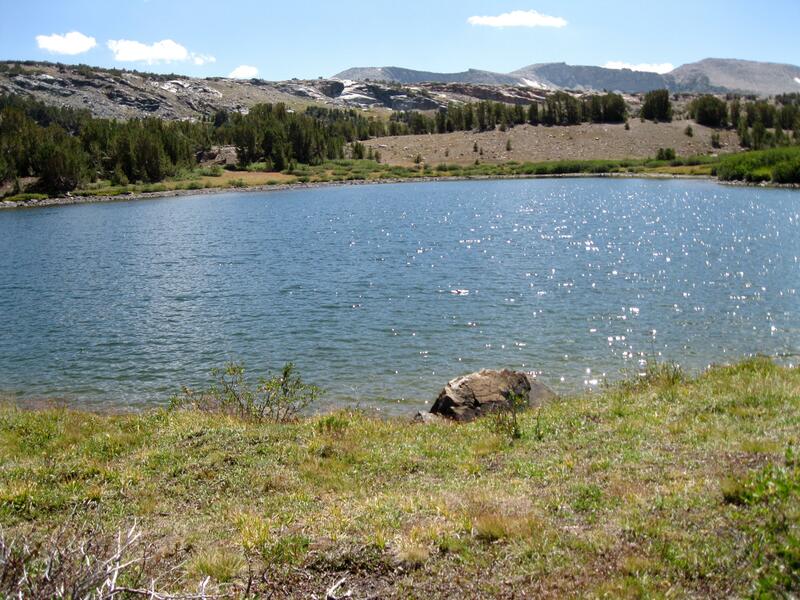 We walked by Summit Lake, located at Mono Pass summit at 10,599 feet, a pretty little lake where a family sat for a picnic. Sturdy-looking trees able to endure the worst winters grew in patches. The terrain became dark reddish-brown shale and the trail twisted and turned up and down. As we rounded a corner Mono Lake appeared in the distance. Mono Lake is 65 square miles and was formed at least a million years ago. It is one of the oldest lakes in North America. 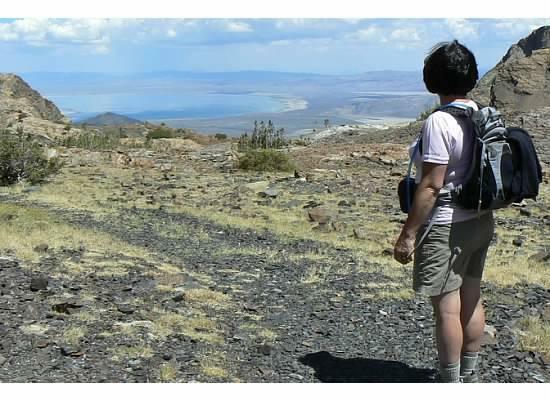 Looking at Mono Lake in the distance. 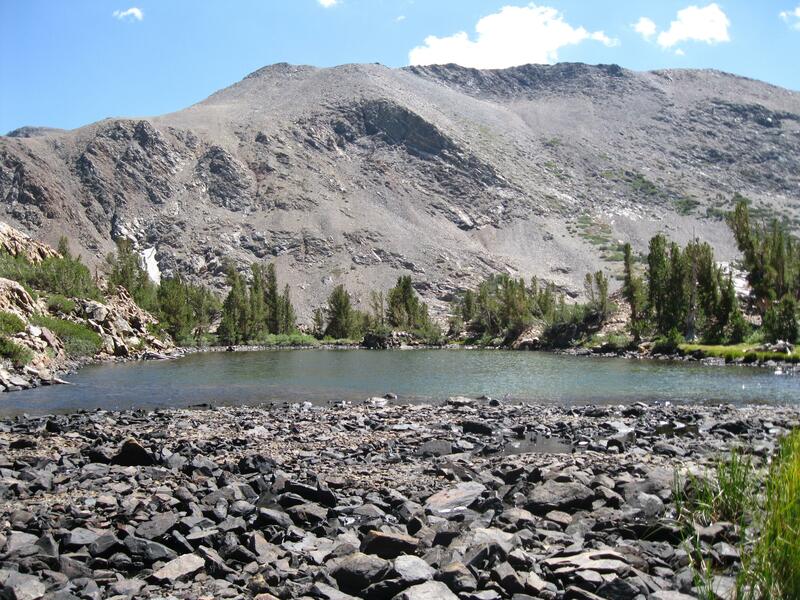 To reach the shore of Lower Sardine Lake, we walked through reeds and over rocks. 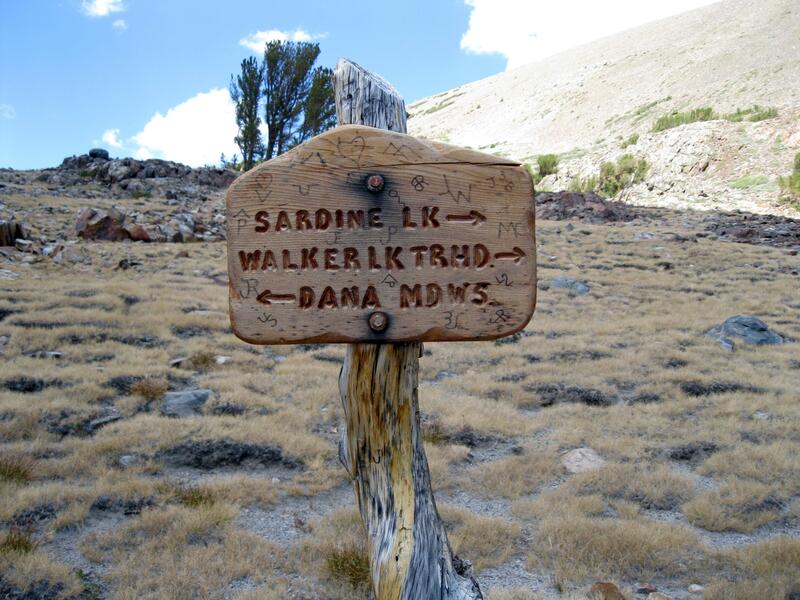 Upper and Lower Sardine Lakes supposedly got their name in 1860 from a pack mule, weighed down with kegs of whiskey, which lost its footing and plummeted down a slope falling into Lower Sardine Lake, taking with it another mule burdened with cases of sardines. However, I’ve heard this story about other Sardine Lakes in California so who knows if it’s true. We made this our turnaround point and headed back to the car, happy that we had another exciting day in Yosemite. 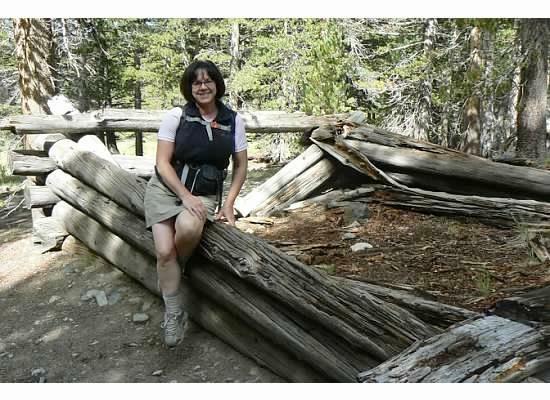 This entry was posted in Yosemite Hikes and tagged Ella Bloss Mine, Golden Crown Mine, Hiking, Lower Sardine Lake, Miners cabin, Mono Lake, Mono Pass, Sheepherder cabin, Summit Lake, Yosemite on August 22, 2012 by Janet. Everyone should be so lucky to have a daughter who enables them to vicariously experience so many fantastic hikes. Thank you, Dad. Maybe one day you can join me. Lovely photos and what an awesome part of the country to hike in. Hopefully one of these days I can try a few of those trails myself. Stay safe and keep on hiking. What a gorgeous hike! I’d like to have that (miner’s?) cabin by my pond!